Whew, y'all! It has BEEN. A. MINUTE. since my last post... almost a month to be exact. It's like this moving/working full time/wedding planning/traveling thing makes me busy or something!? In the time since I last popped on, I have had several wedding festivities! I thought the perfect way to jump back in would be with a recap of the two showers I had. Don't worry, this isn't all about me! I want to give YOU the best tips as a bride, an attendee or a host that I've learned over the past year. My precious mother-in-law and her friends from church threw me the sweetest shower in Jackson, TN. It was my first one and these ladies really set the bar. It was classy and elegant and more than I deserve. 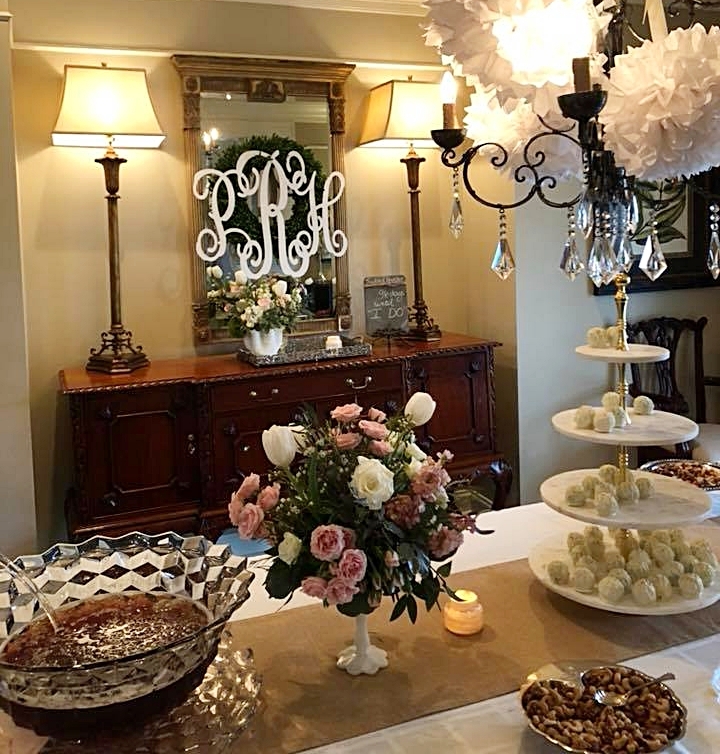 Here are some pictures to give you an idea of how gorgeous the home and decorations were! I'm sharing some tips and ideas under each photo so don't miss them when you scroll! Tip: Pick colors to theme the shower around. They chose a pretty, soft pink and cream palette that just screamed "bridal" and of course, I loved it! It will make decorating easier if you select certain colors. If the bride has a color scheme she loves for her wedding, play on that for inspo. Tip: The personal touches of this shower made me feel so special! The custom monogram was a gift for me to keep. I love that I can hang it on our first home and remember the women who came together for the shower. I love that the chalk board is personal too! The napkins were such a gorgeous touch and made the shower seem more formal. Small details like a custom napkin show the bride that the hostesses were thinking in advance. They put so much thought and effort into making it person and it was so appreciated! Tip: Serving finger foods makes it so easy for the guests to serve themselves. You don't have to worry about serving spoons or having silverware on the table. Cake balls...10/10. Also you can discreetly walk by and shove several in your mouth between conversations without anyone noticing, a plus. My second shower was thrown by a close-knit group of mothers and daughters in my hometown, Starkville. They pretty much embody southern hospitality so, needless to say, the shower was absolutely beautiful and looked like something out of Southern Living. Does anyone know when the wifey, homemaker, hostess skills come in? Let me know. Here are some deets on this shower. Tip: Attendees, take pictures during the shower! Your bride will be busy chatting with guests, so take the camera and start snapping. The bride will be so appreciative and will love having the pictures later. Tip: Your foods don't have to be incredibly fancy to be beautiful! Focus on how you present them. The fruit on the skewers is super cute and also really easy to eat. Side note: The hostesses have the most gorgeous collection of pottery! I love how it all matches! Goals. Tip: Incorporating the brides favorite foods is a really thoughtful way to show her that you care! Shrimp and bacon are two of my person favorites, so this bacon and shrimp and grits combo was a HIT in my book. Tip: Have an area designated for gifts. 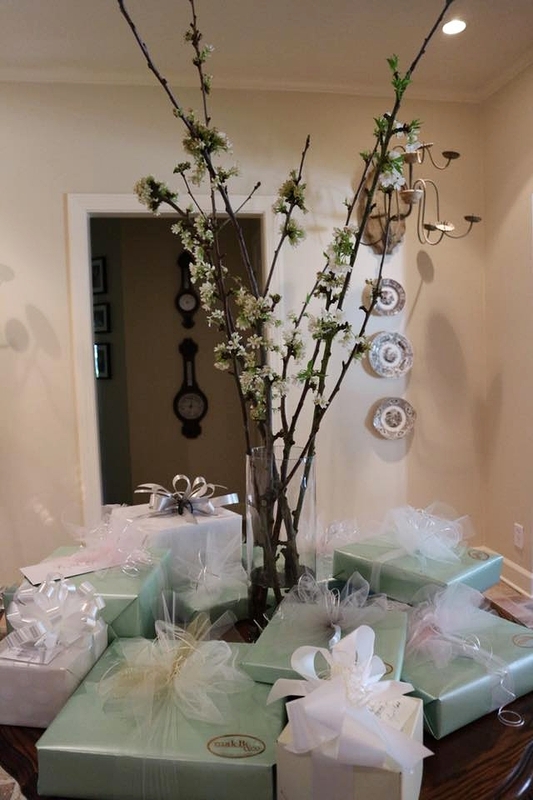 It is nice to have a small table, bench, couch or corner cleared so that guests can place their gift down as they enter the party. And it makes for a pretty picture. If you are helping plan a shower and want ALL the tips and details, checkout this post from WeddingWire. I used it when I helped plan a shower for my friend and it gave me so many great ideas. If you are planning, your friend will enjoy it no matter what because you were thoughtful enough to host it! If you are a bride, get ready for an amazing day because these things don't happen twice! Soak it up.